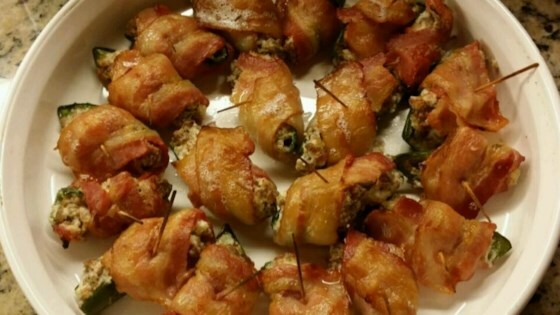 "This is a recipe for stuffed jalapenos I had at a baby shower in Texas. I loved them and have made them for every party since. They are always anxiously requested, a HIT AT EVERY PARTY!!!! Use toothpicks to secure the bacon around the stuffed jalapenos. Be sure to use a pan that won't let the bacon drip all over the oven while cooking!" These were sooo good. You will need more bacon than listed (consider 30 jalapenos cut in half=60 individual appetizers=60 bacon 1/2's) and they do take time, but so worth it! Took this to the concert picnic. Was told to bring it next week! Huge hit with everyone! !